How Do You Write a Quadratic Equation in Intercept Form if You Have a Graph? 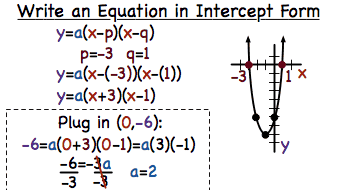 If you want to write the equation of a quadratic in intercept form just from its graph, you can use the x-intercepts and one additional point on the graph. Those three points will tell you all you need. Follow along with this tutorial to see how to use the graph of a quadratic to write its equation in intercepts form.